Meet the Linx 7, the cheapest Windows 8 tablet yet. (As of 16/12/2014, Ebuyer is bundling a free Targus Universal In-car tablet holder worth a tenner when you buy the Linx 7 from there). The term "cheap" is usually associated with Google's Android operating system. Until recently, Windows tablets were considered to be more expensive, but that changed earlier this year. Both Microsoft and Intel feared that ARM and Android might effectively use tablets as a Trojan horse to make both Wintel laptops and desktops redundant. It explains why the two companies chose to discount their hardware and software so significantly. Intel reportedly spent billions on marketing and support for mobile device makers while Microsoft gave away its crown jewels (Windows 8.1 and Office 365) for devices with displays smaller than nine inches. It's in that context that we're reviewing the Linx 7, a Windows-powered tablet that costs just under £80. Linx - not to be confused with Lenovo's Lynx - is not a totally new player having sent us a Commtiva Android tablet four years ago. It costs even less if you trade in a working tablet as the promotion runs until March 31, 2015. Should you do that, the price falls under £50 which is pretty good – and unexpected - for a tablet that comes both with Windows 8.1 and a year's subscription to Office 365 Personal (one that comes with 1TB storage by the way, moving to unlimited pretty soon). 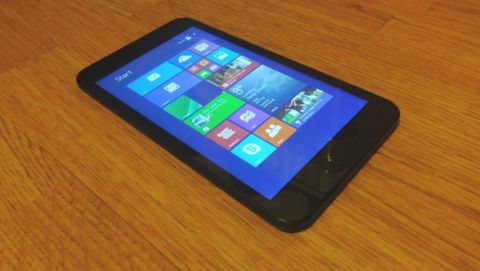 There's a few differences compared to the other "cheap" Windows tablet we reviewed, the Pipo W2. The Linx one is widely available in the UK (so you don't end up being stung by a custom duty fee). You also get a full warranty (as it is sold by a number of online retailers including Amazon and Ebuyer) but no Office 365 physical coupon. So, there you have the good. As for the bad, well, it has a meagre 1GB of RAM and the rear camera is a 2-megapixel snapper; so don't expect any miracles. The rest of the hardware is similar to the W2. Inside is a bog standard, quad-core Intel Atom Bay trail-based processor, the Z3735G, clocked at 1.33GHz. It has a 1280 x 800 pixel-reslution display (because it's a 7-inch panel, it has a higher pixel density than the W2), a 2-megapixel front-facing camera, Wi-Fi, Bluetooth, a microHDMI port and a microSD card reader. Two cables (microUSB to USB and a USB to micro USB) are also bundled. There's also 32GB onboard storage although only 24GB are usable. That's because there's a 4.8GB recovery partition that you may want to delete. After installing Chrome and any necessary Windows update files, 17.59GB (or about three quarters of the available storage) was still free. The tablet is about the size and weight of a Google Nexus 7 (2013) tablet which means that it is small enough to be comfortably carried in a coat pocket. Its 16:10 aspect ratio means that holding it in portrait mode feels natural; unlike the W2, it is designed to be held in that mode rather than in landscape. This also impacts the location of its physical Windows button as well as that of the front-facing camera. As expected most of the ports are located on the top of the device while the power and volume buttons are located on its right hand side. Its finish surpasses our low expectation for such a keenly priced device; its plastic back is matte, not unlike the Motorola Moto G smartphone and it's sturdily built. Its screen surprisingly doesn't bear the hallmarks of an entry level model. It's an IPS model that uses glass rather than plastic (it feels cold to the touch and doesn't have dreaded pressure marks).